DALLAS, TX--(Marketwired - Apr 17, 2014) - International research firm Parks Associates finds increased penetration of broadband solutions has greatly impacted the market demand for smart home solutions, as there will be nearly 720 million broadband households worldwide in 2014, with 137 million in Western Europe and 57 million in Eastern/Central Europe. The firm, in collaboration with Orange, Panasonic and Verisure, will present key market insights and lead an interactive discussion in the complimentary webcast "Internet of Things: Smart Home Success through Bundled Services" on April 23, 2014, at 15:00 Central European Summer Time (8:00 a.m. Central Daylight Time). Parks Associates notes there will be nearly 151 million PC households in Western Europe by the end of 2014. Increased usage of broadband, connected CE, and smartphones across Europe paves the way for the next step in the connected evolution: getting everything online. For example, there will be over 25 million smartphone households and over 15 million households using cloud storage in Germany in 2014. Wireless technology is embedded in all kinds of products that keep people in touch with their home, family, and what matters most. This evolution is called "the Internet of Things." 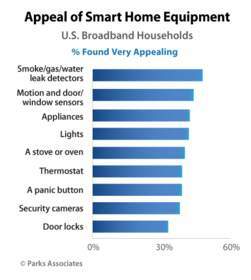 "Smart home solutions are in market now, and consumers are faced with increasing choices. Early participants in these markets are quickly learning how to appeal to new markets and how to properly position product offerings," said Stuart Sikes, President, Parks Associates. "In this webcast, we are pleased to host Orange, Panasonic, and Verisure to explore challenges in moving beyond the early adopter segment in the smart home. The Internet of Things creates new value propositions, and these industry leaders will provide insights into the critical questions in moving this market forward." Parks Associates, Verisure, Orange, and Panasonic will answer audience questions and provide insight into new strategies, consumer trends, the current competitive market, and challenges and misconceptions facing smart home retailers, manufacturers, and developers. For more information, contact Parks Associates at sales@parksassociates.com or +1 972-490-1113. Parks Associates is an internationally recognized market research and consulting company specializing in emerging consumer technology products and services. Founded in 1986, Parks Associates creates research capital through market reports, primary studies, consumer research, custom research, workshops, executive conferences, and annual service subscriptions.